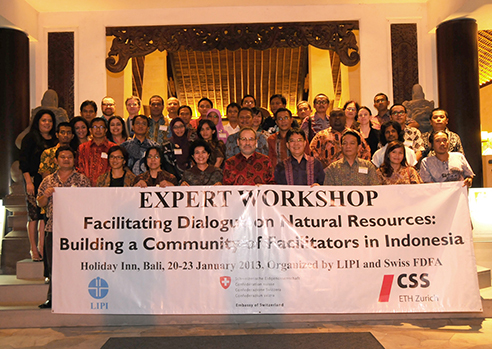 LIPI – the Indonesian Institute of Science – and the Swiss Federal Department of Foreign Affairs, together with the Mediation Support Project and the Centre for Humanitarian Dialogue, organized a three day workshop on Dialogue Facilitation of Natural Resource conflicts. The aims of the workshop were to create an amenable environment to reflect about the modalities of building a network of facilitators, as well as to enhance the capacity, skills and knowledge of mid- to senior level practitioners from Indonesia (ministries, think tanks, NGOs etc. ), to facilitate dialog processes related to natural resource based conflicts in Indonesia.